These things happen in cycles, they say. It’s a recurring process – dysfunction breeds dysfunction. That was how it was once, but not anymore. When I see my blood now, spilling from my wounds, I know it’s a sacrifice. My choice. It wasn’t always that way. It’s staining the white ribbon I have attached to my black stealth suit, but there was a time when the bloodstains in my clothing were not the result of anything I had done or a fight I had asked for. Changing that took great effort, but now that it’s done, it’s what has made me who I am, and I’m grateful for that. I’ll have to replace it again, that ribbon; I usually do after one of my “outings”. I have a whole collection of them, pinned to a scarf that’s draped on the inside of my bedroom closet – rows of satin twists dotted with crimson. I know that big gash looks bad, but I’ll heal and the scar will match the others, like notches on my belt. Only the newer scars, like I said, are by choice, whereas the old ones weren’t. And as the cliché goes: “you should have seen the other guy.” I bet his scars will be worse. Most people don’t remember much about their childhoods, or they recall mostly pleasant memories, with only a few jarring instances that have been etched into their brains permanently. I have a semi-eidetic memory, so I remember more of my childhood than I would like to, especially considering that most of the recollections weren’t all that pleasant. The majority were the jarring kind, the kind that make you feel hollow inside and hang over you like a dark cloud. Some of them are even worse than that. Those are the kind that make you want to close your eyes and just scream, maybe never stop screaming. When I scream now, it’s a battle-cry – it’s in triumph. I grew up just outside of Yarmouth, Nova Scotia, a place called Arcadia, although there was nothing heavenly about it for me. People often assume that life in a rural area close to the sea is a placid one, but it isn’t that way for everyone. My family was poor, dirt poor, and nobody ever let us forget it. I got teased at school, mercilessly, for wearing second-hand clothing and eating brown-bag lunches, usually a PBJ and if I was lucky, an apple. The cruelty on the outside of my home was tolerable. It made my life unpleasant but the hurt was only minor, a breath of fresh air in a way. Not so, on the inside. I wished I could be invisible then, but I wouldn’t have wasted it on the bullies at school. Not when there was something worse at home. Unfortunately, I wasn’t destined for such things at that time. I think I had to endure a certain amount of hardship until something in me just snapped, or maybe I needed to hit puberty, and whatever changes that came with it that triggered my ultimate transformation. I’ll probably never know, and honestly, I don’t really care. So, I lived my small, sad, painful life in the suburbs of an equally small town, one that didn’t offer any means of salvation. I dreamed of running away to the city and finding a safer place to exist, expecting somehow to be self-sufficient. I didn’t dream of fleeing to one of the really big cities like Toronto or Calgary, so big they were scary. No, Halifax was big enough for my escapist fantasies, ones I turned to when things got really bad. Children don’t realize that running off to a place where they have nothing only leaves them open to become the victims of even worse predators. You hardly ever hear of success stories of those who have left a home of abuse for homelessness. Those are often the junkies and crack-whores, the people who beg or turn to crime to survive. I’ll never know what drives a man to batter a woman he once claimed he loved, or his children for that matter, people his instincts are supposed to compel him to protect. That’s a cycle too, they say. Perhaps the people who were supposed to love him had abused him too when he was younger. As an adult, something causes his temper to flare, a frustration accompanied by the desire to vent rage. He goes home to his family, and then the slightest thing that irks him, the most meager excuse, sets him off. This is the faulty coping mechanism he has learned. He will beat on his wife or girlfriend until that rage has expired. My father hit my mother like that and he didn’t care if I was watching at the time. Sometimes a man will take it out on the children too, especially if they try to protect their mother from his rage. If his anger burns long and strong enough, he may even kill someone. I never tried to protect my mother, too frightened at the time to react, but he still beat me if I did something to irritate him, or if he just got tired of beating on her. As I mentioned, I wanted to disappear. If only it could have happened sooner, before I started faulting myself for letting him hurt her. I know I couldn’t have helped her, but I think it’s that guilt, that sense of obligation, that drives me to do what I do now. That or the parts of her I see in other people. I don’t know which in that case, either. It wasn’t during the brutality phase of the cycle that I snapped. I know that might surprise you. No, it was in what they call the “honeymoon phase” when the change first occurred. All the apologies, the presents, the wooing to restore her affections – I couldn’t bear to watch her forgive him one more time – to let him back into our lives so he could do it all over again. I understand that it’s not entirely her fault, choosing to take him back. He reintroduced the charm with which he had won her over in the first place. It’s all about manipulation, control and power. It’s about ownership. Their lives were tightly intertwined by that point. She was dependent on him, had a child with him and wanted to believe his promises that he wouldn’t let the abuse happen again, even though it always did. I had been hiding in the stairwell, not wanting to look at her new bruises, including the latest black eye – not wanting to watch him offer her flowers as he wept, stammering, crouching, and hugging. I had known she would bow her head, stroke his hair, tearfully forgive him and start that cycle over from the beginning. I just couldn’t stick around to see that happen again. I was getting old enough that he would hit me almost as often as he did her. She could forgive him again that time, but I wouldn’t. Determined, I went up to my room and packed my bag with all the most essential things I felt I could carry. I didn’t know where I would go. My grand-parents were dead, my mother’s family had disowned her and my father’s family had moved to Alberta looking for work and had never come back. A lot of people in our home town had done that. It didn’t matter. I had already decided that I would live on the streets if I had to. I was ready for escape. I hoped to slip away without them noticing me, but to get out of the house I had to dart from the door by the stairwell to the back door, or cross the room they were in completely if I went for the front door. I prayed they wouldn’t see me, too distracted by their own drama to notice my departure. I held my breath as I crept the few feet between one door and the other. As I reached for the doorknob, I realized they were both looking my way, but neither were looking at me…in fact, they seemed to be looking right through me. There were no questions, no accusations, none of the things I would expect if they caught sight of me sneaking out with a full back pack. I swore they couldn’t see me. Testing that theory, I made for the front door instead, tiptoeing boldly across the room. Their eyes did not follow me, and once again, nobody demanded to know where I was going. I stepped through the door and was free, in more ways than one. But I had yet to break the cycle. Once I had left, I made my way to Halifax to try to follow my fantasies, by sneaking onto a bus. It was easy, climbing on unseen and tagging along for the ride. Nobody noticed me there anymore than my parents had. I figured I’d find better opportunities in the city especially with my new ability to disappear. Reality is never quite as good as the fantasy, though, even on the best of occasions. I managed to get out of the situation of abuse, but that’s not the only thing you have to escape to remove yourself from the cycle. I still carried the victim mentality. I wanted to avoid being the victim by simply disappearing, but avoiding the problem doesn’t solve it, it just puts it off for a while. I also discovered a few hitches to that method. For one, if you take yourself out of the picture, the abuser will just choose a new victim in your absence. All you’ve done is foist the problem onto someone else. Secondly, I didn’t physically disappear; my invisibility was a mind control trick. I could “convince” a person looking at me that I wasn’t actually there – kind of like a Jedi mind-trick, only I didn’t have to tell them that they didn’t see me, or wave my hand. What that meant was that if I was asleep, unconscious or just not focusing on making that person not see me, I was very easy to see. That couldn’t prevent me from being a victim 24/7. I admit, the trick helped when it came to living on the street. I could always get food, but finding somewhere safe to sleep proved to be a problem. I tried sneaking into places during the day and hiding myself away, but once I was asleep I had no way of guaranteeing I wouldn’t be discovered. After a few very scary near misses, instances where someone stumbled upon me when I couldn’t make myself unseen and reacted hostilely to my presence, I realized that in some ways I was just like any other street person. I had to squat where I wasn’t likely to be found, and that meant forming some unhealthy alliances. There were three males who squatted in the old vacant house off of Dutch Village Road with me and three other women. One of the men was old and not likely to give us much trouble. The other two were normally okay, and sort of looked out for us, as long as they weren’t high. The problem was that when they did score a hit, they lost their reasoning and inhibitions. Suddenly, we were sleeping amongst the wolves and ones that wanted nothing more than to devour us. I wasn’t that strong, hadn’t taken any self-defense courses or done any martial arts training at that time and was shaken out of a deep sleep by the youngest of our male house-mates. His full weight was bearing down on me and he had shoved his hand over my face to muffle any screams. The old man was asleep, man number two passed out from overindulgence, and the other women either sleeping or pretending to, afraid that my attacker might target them if they tried to interfere, I guess. I remember the pain as he tried to force himself on me, his rancid breath in my face, his urgent gasps and desperate grunts and the unfocussed glaze to his eyes. He was smiling, a dogged grin, lost in the oblivion of those drugs and not caring if I happened to be an unwilling participant. I wanted to make myself invisible, but this time it didn’t work. I think there were two reasons why my gift failed me. The first was because the drugs clouded his mind, unintentionally shielding him from my manipulation to some degree. The other was the fact that being in close contact with me and interacting with me, he was already far too aware that I was there. My normal means of escape was lost to me. However, it turned out that this didn’t mean I was doomed. For the first time in my life, I fought, seeing nothing to lose by it. My attacker fought back – harder. I scratched and kicked, but he kicked, punched and slapped in return, full force. I was ready to give up when I discovered being able to disappear wasn’t my only talent. It was like a switch had been flipped, because instead of trying to hide, and that mentality of avoidance, I now had the mind-set of a wild animal when cornered, do or die. Already inside his head in my attempts to obfuscate myself, I found something else to manipulate instead. As he fought me, I found his memories, violent memories, where he had caused others pain. I took those memories and turned them in on themselves, so he was on the receiving end of the damage he had caused. I kept lashing out at him with the pain he had caused until it was too much and he finally released me. He was clutching at his head, screeching in agony, and his nose was bleeding. He rolled away, writhing and wailing, barely aware that I was still there. And that was all I needed. I reversed the switch to avoidance mode, and suddenly, as far as he was concerned, I was gone. I didn’t wait to see how long the pain would handicap him. I didn’t take the time to grab any of my things. Naked, and badly beaten, bleeding in various places, I ran. I wore the need to go unseen like a veil, touching every mind around me so they did not know I was there. I leapt onto a late-night bus that came into view and rode it without caring, not knowing where it was taking me. My head swam, my heart raced and everything hurt. When I decided I was far enough away, I dragged my barely functioning body off of the bus – knowing it was likely the last run of the night. I found myself in one of the not so pleasant parts of the city, shuffling my way down Brunswick Street in search of rescue. I spotted a homeless shelter there and lurched over to the door, falling against it as my battered frame gave way. The woman who found me at the door, naked, battered, bleeding and unconscious, was named Alicia, although many people called her “Alice”. Alice was an older quirky woman with odd ideas but a kind heart. She had come to the shelter to escape domestic abuse, one of the ones brave enough to take a stand, and she took care of me until I was able to get up and get around again. The night shift at the shelter were going to ship me off to the hospital at first, but I had already come around by that point and was adamant about not wanting to go. My pleas fell upon deaf ears initially, the staff worried about liability if I needed medical treatment but didn’t get it and they were aware that they had no vacancies for new residents. That had been when Alice had offered to share her small space with me, a generous offer. One, it turned out, which would change my life permanently. I took comfort in Alice’s wisdom and calm words. That shelter was the first place that had ever really felt like home. Folks were friendly, for the most part, and the staff noted that I had a knack for avoiding trouble, so they liked having me around. They also appreciated the fact that unlike most of the women at the shelter, my baggage didn’t show up to make waves, in the form of ex-spouses or ex-boyfriends ignoring restraining orders while looking to reconcile or seek revenge. Alice was not so lucky. Then again, she couldn’t just disappear. She had to live with her misfortune when it chose to follow her. But I could start over, and I did. I was willing to help every way I could at the shelter, so they taught me how to do work around the place, kitchen chores, office work and other odd tasks. They even hired me on part-time, officially, when one of their clerks retired. I started to see Halifax as a place where I belonged, not perfect, but better than anywhere I had been before. Reality might not match fantasy, but with enough hard work, you can get closer to it. I didn’t think about my powers much for a while, except for the times where I felt the need to avoid someone and then I would gently brush their mind in order to vanish. I continued to room with Alice, even after another space became available, because we took comfort in each other’s company and she reminded me of the things I had once liked in my mother. She had a wicked sense of humour too, but I always had a feeling that she used it to cover up some underlying fear. Another staff member at the shelter, Loretta, had told me that Alice’s ex had shown up one night, drunk and enraged. He had let them know he was there by bellowing up at Alice’s window, threatening that he would come up there and teach her a lesson if she didn’t come home. The shelter staff had called the police and there was now a restraining order against him, but he had shaken Alice badly and she still worried he would be back to follow through on his threat. That hadn’t been enough to shake her resolve. I had to admire that in her. It was inspiring. Alice was a bit of a spiritual person – not the Bible-thumping, “shove it down your throat” kind, but a believer in things like karma and destiny. She talked about life being a series of risks and challenges, yet if you were respectful of others and lived as good a life as one could live, everyone had a salvation, some sort of amnesty to offer them refuge from the type of storms that could blow in with little warning. I had known those kinds of storms. I suppose she was referring to her ex in her own life. He was something of a tempest for her. She wasn’t wrong about him coming back, only this time he wasn’t kind enough to offer the warning he had provided on his last visit. He quietly climbed up to our window while we were both asleep, and our first indication that he had come to punish her for leaving him was the sound of the window breaking, shocking us awake. He was on her more quickly than you would have thought an older, stumbling drunk man could have managed, fueled by adrenaline I suppose. She had no time to react, which left everything up to me. I had a couple of choices. I could make myself invisible and leave Alice to her ex’s designs while I cowered off to go for help. This time I was not the cornered animal, and I could pick the flight option. Or I could fight for Alice, the only way I knew how, option number two. I don’t know if I would have done it for anyone else, but I owed Alice. I loved Alice. It didn’t take any more internal debate to decide what I had to do. I reached into the intruder’s mind and started searching through his memory, seeking out his violent acts. I know he was aware that I was causing his pain because as soon as he felt it strike, he abandoned his choke hold on Alice and headed straight for me. There was murder in his eyes between the flashes of agony. He threw himself on me, grappling me to the floor. I mostly tried to defend myself from his sporadic and wild blows, raising my hands in front of my face to fend off his attacks, rather than hitting back. Instead, I retaliated blow by blow with my mental onslaught and realized that his history of violence made for a formidable weapon, one he could not ignore. His assault weakened and he concluded that he could not win this fight. Only semi-conscious, he left via the window again, and for some reason I felt that he would never be back. Almost as bad off as he was, I slumped to the floor, bleeding again which I often seem to do. Alice was at my side in seconds, hugging me and crying. The name Amnesty stuck, once I realized what I could do with my gifts. That’s what I’ve been calling my alter ego ever since. 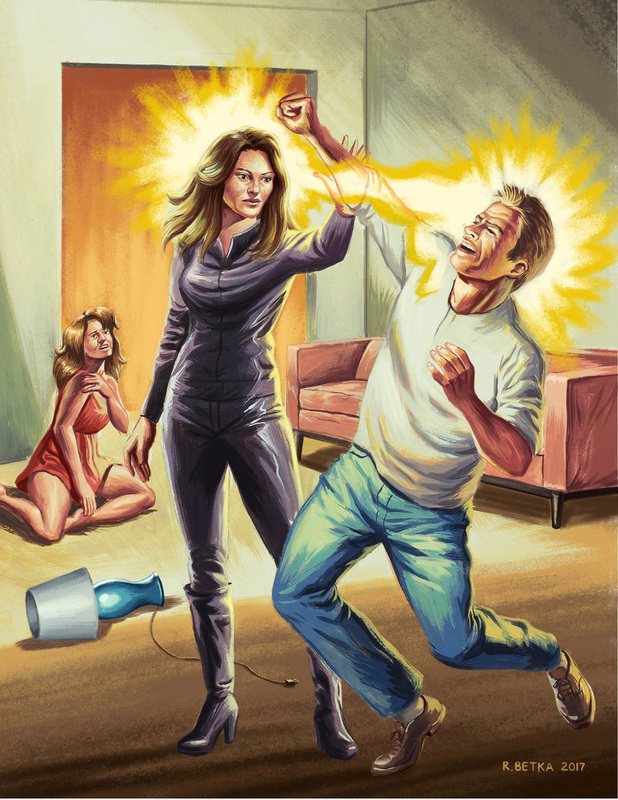 With Alice’s help, I enrolled in self-defense classes and took up martial arts because the people I interfere with, the ones I have to face down while protecting the victims they brutalize, always fight me at first when I turn their own violent nature against them. Until the pain and shock becomes too much, they have to fight back – it’s just who they are. And sometimes they manage to hurt me a little, even on the best of days, hence the bleeding and all the scars. Why am I dressed like this now? The black stealth suit allows me to move through the night mostly unseen as I patrol. It hides my identity in case I miss someone when I’m making myself invisible to others or if for some other reason my mind-trick doesn’t work on them. The white ribbon – the one that I keep attached to my suit and that often ends up stained in my own blood? I was wearing one the night Alice’s ex came for her. It represents who I am and what I do. It’s a call for an end to violence against women and each bloodied one in my closet is proof that the violence still exists, that I still have a war to wage and a battle to win. You might ask why I don’t just make myself invisible to the ones I confront, so they won’t retaliate during these times. Well, the fact is that I seem to have to make a choice between the two powers I have available to me, fight or flight. Like I said, there really is a mental switch and often when I confront them, I choose fight now and I win. I’ve finally broken the cycle. I’m no longer a victim. Instead, for the sake of women like Alice, I’m the protector. Read Amnesty’s continuing story in Clemency! “Merridale’s Command” reads almost like historical non-fiction. A year after Merridale’s graduation, President Wilson declared war on the Triple Alliance. It took another year to rebuild the U.S. Army and ship it to France. Merridale pushed the idea of forming an independent company to test the idea of paratroops. Read the tale of these bold as-of-yet heroes next week!